omg awesome!!! Lets turn CO blue!!! PPP has a HUGE problem with its numbers. According to CO officials, more than 242,682 people in Colorado have gone to an early voting location and cast their ballots. Officials report 880,491 Coloradans have already voted by mail-in ballot. There are about 3.1 million registered voters in CO, which means about 1/3 have cast votes early. That is no where near the 65% your polling claims. You should have checked your polling against official CO election stats. about Early Voting: Most people 50%+ in CO requested Mail In Ballots. These ballots are in the hands of voters. Many, Many Many are holding on to them until election day when you can drop them off in person all across the state. These people count themselves as having voted, so they are showing up in the polling here. 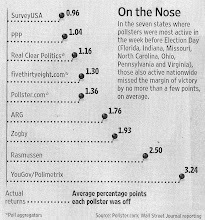 This meshes with reality, figures above are only accounting for received votes in person and on returned ballots through mail. 1.3 million people have already voted in Colorado and in 2004 2.1 million people voted total. Let's say 2.2 or 2.3 million people vote overall this year. That might put us slightly on the high side for people who already voted- people who already voted might be more likely to answer a poll- but nothing like your comment is suggesting. You're assuming that there aren't people who have gotten their ballots but simply haven't mailed them in yet. You're also assuming that 100% of registered voters will ultimately vote. Chances are good that only around 60%-70% of registered voters actually turn-out, which would mean that their number, while probably high, probably is close enough that it won't matter too much. Not all registered voters vote. As a comparison, the total number of votes cast in 2004 was 2,148,036. Also, the up to date number of votes that have been received by the state through 7:30pm today is 1.3M. Some additional ballots are undoubtedly "in the mail." I don't doubt some respondent who tell pollsters they have already voted probably have yet to do so. That doesn't mean they won't vote, or that their vote should otherwise be discounted. Or that there's something wrong with the poll. I think it is safe to say that significantly more people will vote in CO this year than in 2004 because of the intense and historic race, the early vote push, and because the state has about 300,000 more voters now than they had in 2004 (200,000 new voters this year alone). Thus, I think we will see 2.6 to 2.7 million Coloradans vote this time. I'd agree with anon@1:26 (why don't people leave their name or user id?) So the fraction of people who have voted thus far is closer to 50%. If folks have their MIB but don't turn it in, that's obviously not the same as voting. All I'll say is: I live in Boulder, CO, and we will be out in the field the next four days trying to get people to hand in their MIB. And vote for Obama! GOTV, folks - it's still not over! On the internals - it looks like the PPP poll has far fewer unaffiliated voters, while giving a somewhat substantial edge to the Democrats. According to the SoS, Dems/Republicans are ~34% each of "active" 2.6 million RVs, and ~33% each of all 3.2 million RVs (including "inactive"). Yes, I know what this means - if the PPP internals hold up, things are looking even better for Obama. But still... And GOTV, please!! The link broke up in the previous report. easy explanation: the question in the survey was "are you a rep/dem/oth", not "are you registered as rep/dem/oth". generally, the closer you get to an election, the more identify themselves with one of the two parties even if they are registered as independents. Looks like obamas approval ratings are going down.